Do Uber, Lyft worsen Seattle’s traffic congestion? A new study in New York City says the growth of app-based ride-hailing services could undermine cities’ goals of unclogging streets. Seattle officials say that may be true here during commute hours. Traffic congestion is a complex science, and the rising popularity of ride-hailing services such as Uber and Lyft isn’t making it easier. A new study in New York City says the growth of the app-based ride services could work against cities’ goals of unclogging streets and reducing vehicle emissions, as well as potentially undermine other transportation options, such as public transit and taxi services. In Seattle, where congestion ranks high worldwide, transportation officials say transportation network companies (TNCs) such as Uber and Lyft may worsen traffic during commute hours, but they don’t have the specific data to tell. Uber and Lyft refute the New York report’s findings, pointing to the companies’ service of taking people to and from transit stations, for instance, and support for proposals to grow public transportation. According to University of Washington professor and traffic expert Mark Hallenbeck, Seattle’s dense neighborhoods have more at stake in terms of how the app-based services clog roads. People in those areas rely more on the companies compared with those in the suburbs to evade parking hassles, for example. 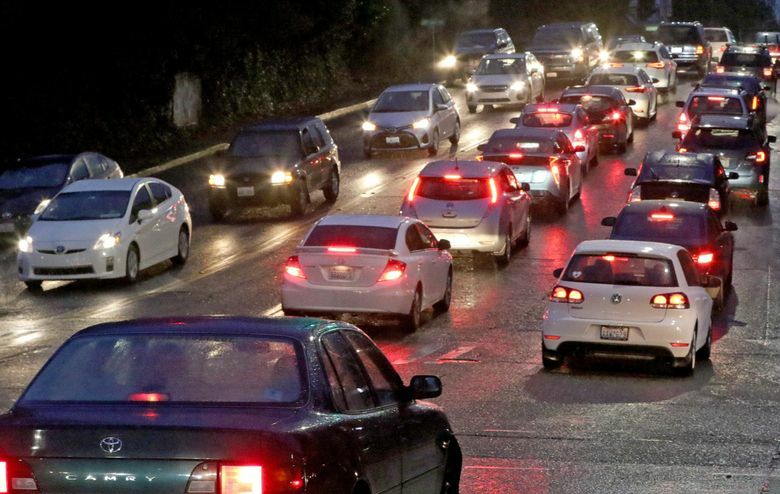 According to the Seattle Department of Transportation, transit officials need certain data from the companies to fully assess their impact on congestion and traffic patterns. She said the city is seeking information such as precise pickup and drop-off locations by time of day, as well as how many people are on each Uber or Lyft trip, for example. Adrian Durbin, a Lyft spokesman, said the company provides a significant amount of data to the city, including number of rides, as well as pickups and drop-offs by ZIP code. And Uber spokesman Caleb Weaver said the company has been working on an ongoing basis to release information to the city that would help planning. Both companies cite maintaining passenger privacy as a top priority for deciding whether to release more information. More than 10,000 Uber drivers and thousands of Lyft drivers operate in Seattle, according to the company spokesmen. Some drivers work for both companies. According to the New York City study, ridership with TNCs there tripled between June 2015 and the fall of 2016, when 15 million passengers used the services per month. For the study, he analyzed electronic trip logs for taxicabs and TNCs in New York, as well as a select file of Uber trips that showed trip destinations, durations and distances. While focusing on New York City, the report emphasizes that its findings could be applicable to urban transportation systems everywhere. Users gravitate toward the app-based services because they can offer rides that are more available and reliable than taxi and transit services, the report says. Also, people can avoid parking problems. “They use TNCs when they are in a rush, when it can be hard to get a cab, when public transit is not available or parking is difficult, as well as to avoid driving after drinking,” the study says. In the Seattle area, transit ridership actually increased last year, nearly doubling that of any other U.S. metro area, according to figures compiled by King County Metro Transit, using preliminary data from the Federal Transit Administration. Compared with less dense places, such as the suburbs, the UW’s Hallenbeck said neighborhoods such as Seattle’s Capitol Hill, Ballard, downtown and Pioneer Square provide more opportunity for ride-hailing trips to take away from transit. But Hallenbeck believes it will grow when or if the quality of transit service declines, such as when buses become overcrowded like in New York City. Material from The Seattle Times archives contributed to this report. Jessica Lee: 206-464-2532 or jlee@seattletimes.com.